Here's the thing you guys. As much as I love and appreciate good design and clean lines and attractive aesthetics and all that, I am basically the most disorganized person of all time. If I'm really into a creative project, I become so focused on it that papers start flying everywhere, piles build up, and before I know it I'm surrounded by sheer mayhem. Most of the time, my office and studio look pretty bad. Thankfully, I have a wonderful employee (hi Kari!) for my clothing label who keeps our merchandise and shipping supplies all neat and tidy in her at-home 'warehouse.' Not-so-thankfully, I am the one who fulfills the art/greeting card line, and my shipping supply situation is, well, a little dire. 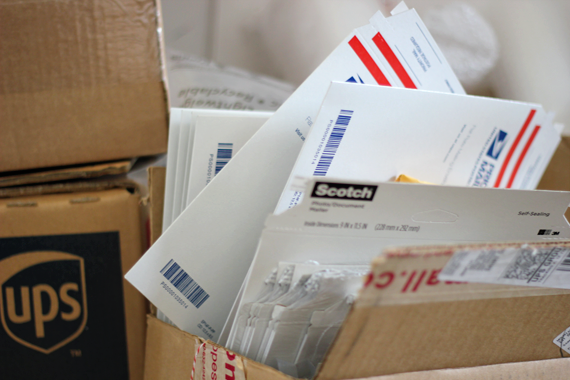 I'm talking chaotically stacked shipping boxes and envelopes, labels, tape, and all sorts of random items mashed together in deteriorating cardboard boxes that are haphazardly pushed up against a wall in my home office. It's been madness for a long time. With a new baby on the way, I've begun to realize the necessity of getting things in order around here. And my shipping supplies, which have spilled over into the soon-to-be-nursery space, were one of the first things on the "must deal with" list. Lucky for me, I was contacted to see if I'd be interested in heading over to the local Home Depot to pick out and try some of Rubbermaid's new All Access Organizers. My response was something along the lines of, "duh, yes!" and the next day, I had four of the organizers in hand - two small and two large. 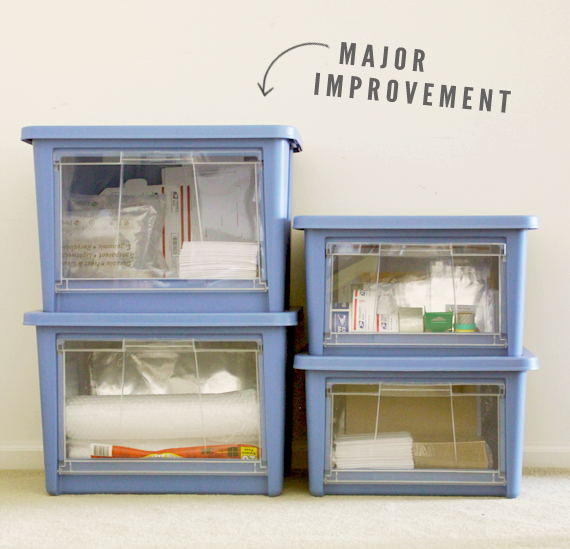 Honestly, these might be the best organizational inventions ever. I actually have a ton of traditional bins and containers in my garage, and they work well for storing and organizing items - but their design doesn't exactly make it easy to find and access what I'm looking for (especially if it's a bin at the bottom of a stack!). The great thing about these All Access Organizers is that they feature clear drop-down doors, so you can easily see what's inside, even when the organizers are stacked on top of one another. They also open from the top, and they easily stack, which is ideal for my tiny office space. 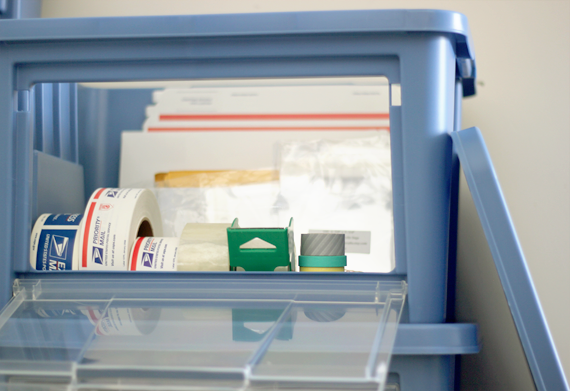 In the end, I took my embarrassing nightmare of a shipping area and organized it neatly into these four containers. 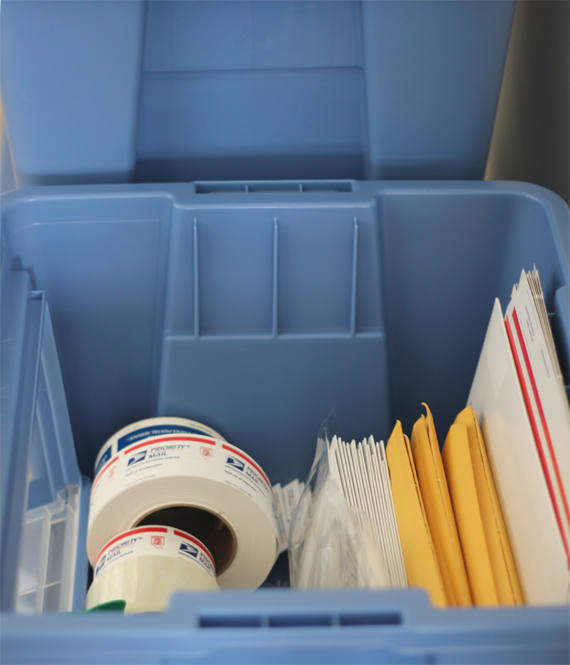 And, despite downsizing the area of space taken up, I was also able to fit my card printing supplies, envelopes, and other office supplies into them. I've even shaved time off of my work day thanks to my new ability to easily get to the items I need, without having to dig around. I'm telling you guys - the All Access Organizers seriously open up the possibilities of easy access. This is the truth. The next organizing mission on my list is to head back to Home Depot to grab more of these babies for the closet in the nursery, as well as for the laundry room and the basement. They really are perfect for anywhere you need storage. 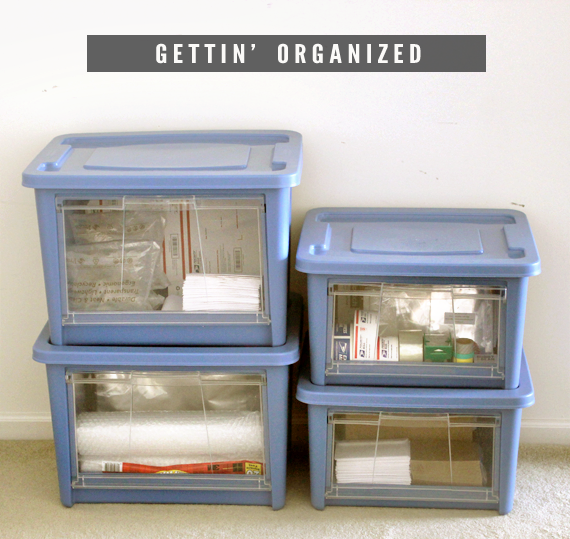 If you want to learn more about these rad little organizational superheroes (which come in three sizes and two pretty colors), visit Rubbermaid's website and Facebook page, and Home Depot's website and Facebook page. Have you organized any of your spaces lately? Anybody else tried the All Access Organizers yet? Thank you for supporting Bubby and Bean by allowing me to post occasional sponsored content. All sponsored posts feature products or services that I genuinely feel would be of interest to you, my readers, and always include my honest opinions. The drop down clear doors are perfect!! Saves you so much effort from lifting bins off of each other. I love a bit of organisation! I HAVE to get some of these buckets. I love order and clean lines, all of that as well, but am pretty incapable of pulling it off. These buckets look like what I need. THANK YOU! These look super handy! I love that they are clear on the side and open from the side as well! 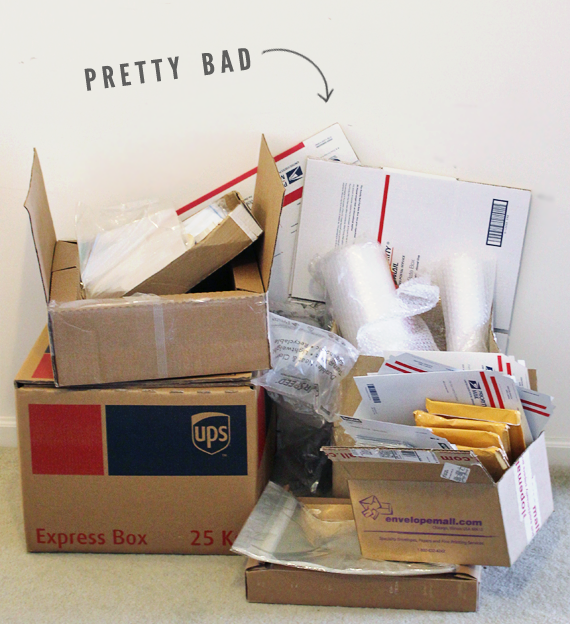 An organized shipping station is definitely on my list when my new studio is complete! I have supplies EVERYWHERE! the clear doors will make everything much easier! I'm soo disorganized this will help me a lot!! I'm so unorganized too! I try to clean my studio once a week because it starts to get crazy. That doesn't always help though and then the boxes from card stock orders and such start to pile up. My fiance gets annoyed so he finally helps me clean sometimes, but then I feel guilty for the craziness! haha! SOLD! 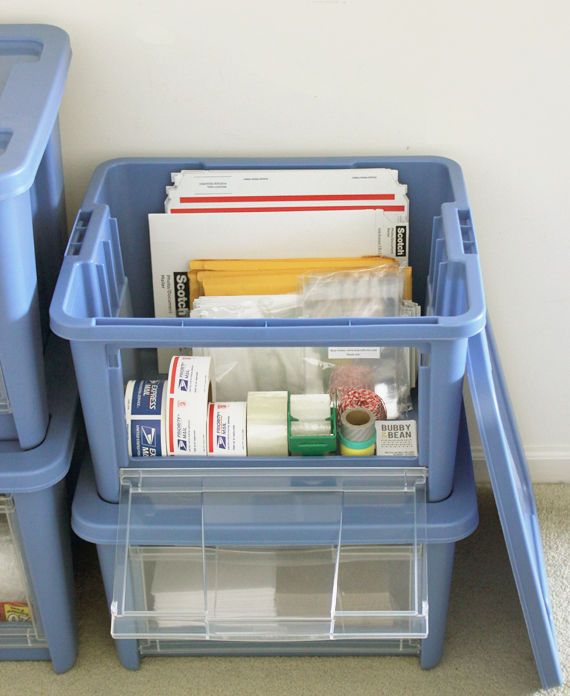 =D My shipping supplies are also in a very sad, messy state and these Organizers just look cool, want! i bet you feel such satisfaction when you look at it all organized! hooray for finding things quick and easy.